“I believe that this is an excellent introductory text; it covers all the fundamental introductory issues that college undergraduates need to address. The students who have used preliminary chapters of this manuscript … have found it very readable and interesting, and this is important for teachers of introductory courses who hope their students will want to take additional biblical courses to deepen their understanding. “Cosby’s text strikes a good balance in presenting challenging new ideas yet not overwhelming the beginning student. “His own personal experiences in “crossing cultures” are very interesting to the students and have provoked some good class discussions. “Since I have had the advantage of actually using some preliminary chapters with my students for several semesters, I can absolutely affirm that it is appropriate for my introductory course. “The first time I saw the way in which Dr. Cosby arranged the various chapters, I was not too certain that it would be an approach I would want to use. However, … I did revise my syllabus to follow Dr. Cosby’s schema…. After using this approach, I found that students were better able to deal with the narrative characteristics of the Genesis 111 material with less stress and more attention to the theological elements. 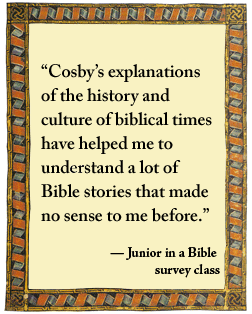 Since my course is taught at a Catholic university as part of a Theology department curriculum, I added more theological discussion at various points, but I think this will remain the professorial privilege as Dr. Cosby’s text is used in various academic settings. “Over the twenty plus years that I have been teaching this introductory course I think I have examined just about every intro book that has come on the market. None of these were completely satisfactory, particularly those that assumed they were writing for a Protestant market; I have wanted a text that gave adequate attention to the Deuterocanon without neglecting other issues. My challenge has been to teach from a Catholic perspective at a Catholic university with a student body that is only about 35% Catholic. So every time I attend any biblical conference (CBA, SBL) I always spend considerable time looking at the new offerings on the introductory level. This is one of the reasons that I was so delighted to learn about Dr. Cosby’s project; it seems to be exactly what I am looking for. Dr. Stachow asked her students to provide Dr. Cosby with comments about Interpreting Biblical Literature. Here are excerpts from their statements. “I have thoroughly enjoyed having the opportunity to use your textbook this semester…. 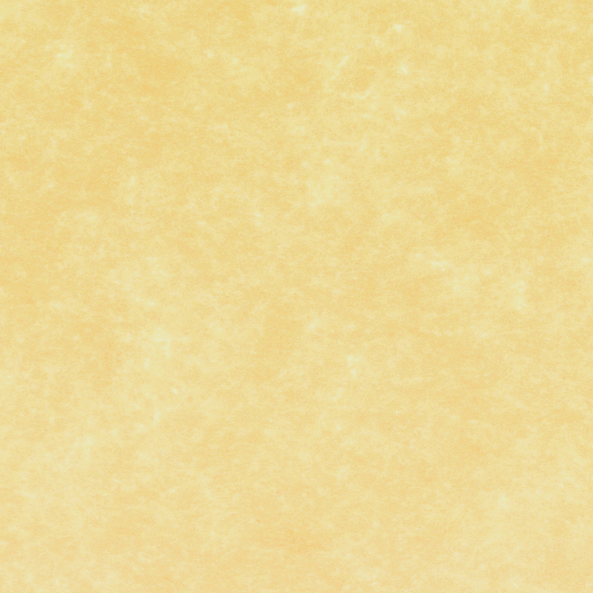 I very much like the way you bring the information down to a level that is easily understood …. 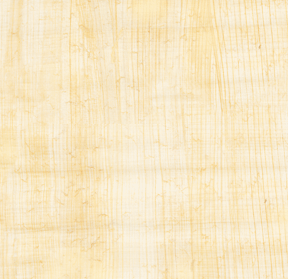 The wording you use, as well as the layout, make the Bible seem to come to life and therefore, easier to understand…. Sometimes I catch myself trying to fall asleep whenever I am reading other textbooks, but never with yours.” Julia J. 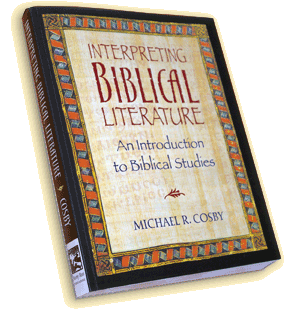 “Unlike most textbooks I have read your textbook Interpreting Biblical Literature actually caught my attention. This textbook is not a boring textbook at all. I think it was great the way you took the work from Biblical times and turned it into an understanding that many of us can relate to today. Many of us have discussed among ourselves that the way Dr. Michael R. Cosby writes is awesome…. I would recommend this textbook for any introduction to theology course.” Jochele G.
“I’ve learned more from your book than from years of study at my former CCD school…. The book showed me that learning religion can be done in the company of reason…. I enjoyed learning from your textbook very much!” Cami Giang N.
“The use of pictures and the setup of each chapter made the book easier to read in terms of understanding…. Another thing that I really liked about the book was the discussion questions at the end of each chapter. I liked that you posed questions that could relate the theme of the chapter to what is happening in modern day society…. I really enjoyed reading this book and it is to you I owe the credit for a better knowledge of the Bible.” A’Sha L.
“Through your book, I have discovered many intricacies that I had never imagined.” Diane Q.